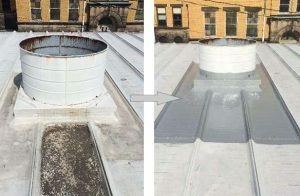 We provide commercial and industrial flat roof leak repairs. We offer 24/7 emergency roof repair service and respond quickly. We provide uncompromising efficiency, the highest quality workmanship, and work completion in the shortest time possible. Roof leaks can be very disruptive to business operations and also cause damage to PCs, servers, printers and other electronic equipment. If you suspect a problem, call us right away. Many times we can apply a quick temporary repair to avoid expensive building interior damage. We also provide roof restoration services to extend roof life, as well as a very attractive RoofShield© Roof Maintenance Program. 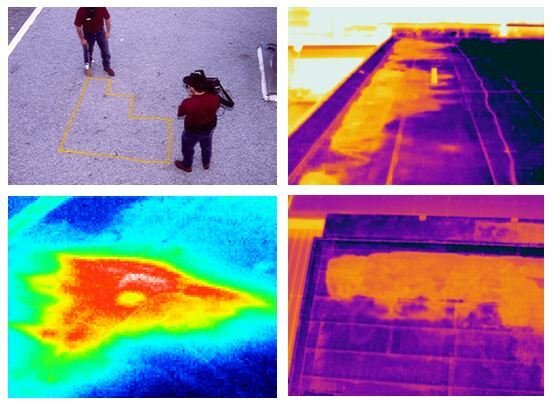 To aid in detecting moisture roof defects, we utilize infrared scanners which create a differential temperature profile of the roof. This indicates where anomalies beneath the roof surface occur. Our roofing scanner technicians interpret the anomalies to identify those that are from normal building sources such as light fixtures or pipes, and which anomalies may indicate where water has seeped beneath the roof surface. The suspected roof defects are verified by taking roof cores and capacitance moisture meter probes.